Home > R36 > R36 Nissan GT-R in 2013 ? 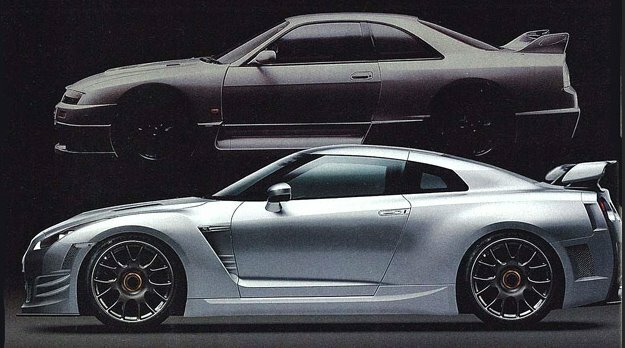 Pistonheads are reporting that a replacement for the R35 GT-R is on the way for 2013. Speaking to PH later on – while waiting for a rapid ride around the Nurburgring circuit in a Spec-V development car – Andy confirmed that a model replacement programme was still in place in spite of the economic downturn, based on a roughly similar timescale to the Porsche replacement cycle. With the 911 GT2 being the car Nissan likes to benchmark, that puts a lifespan of 5-6 years on the current R35 - according to our rudimentary maths. Unsurprisingly, Andy also confirmed to us that the next-generation GT-R will be an evolution of the current platform, and will therefore retain the twin-turbocharged V6 and rear transaxle configuration. I think they have it off a few years, Porsche has never replaced the 911. Its been the same since 1963. Well, not exactly the same, but updated over the years. Expect the next update to the GT-R to be a minor life cycle change. Things like headlights, tail lights , minor driveline things. Don’t look for any Infiniti Essence type hybrid powertrains for 2013. The R32 to R33 to R34 GT-R were evolutions rather than revolutions of the Skyline GT-R. Expect more of the same for the “next” GT-R whether they call it R36 or if it stays as the R35. Nissan has officially confirmed its commitment to its GT-R program by announcing that they are to replace the current R35 model. The new R36 model will hopefully be on our streets by 2013 so will hopefully appear in the next Gran Turismo game, you never know, we could have a PS4 by then. Looking back on this now, in 2011, I was probably more right than wrong.